Use them in a tart! Struggling to use up that glut of cherry tomatoes from the greenhouse? Here's my recipe that will get rid of about 25-30 of them, depending on the size of your tart tin, plus it's really quick and easy to make. 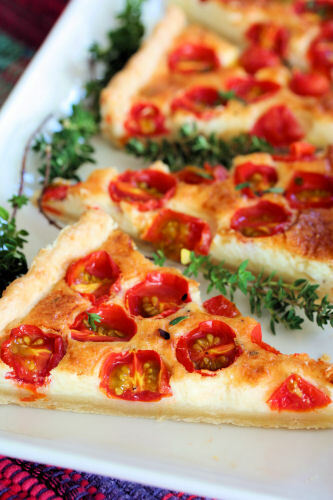 You can use ready-made pastry or make your own - I've added fresh chillies and Parmesan cheese to the pastry, which gives a lovely flavour and spicy heat to the tart. The amounts here are for a tart approximately 13" x 5" in size. If using ready-made pastry, you can add the finely chopped chillies to the filling if you want a bit of heat. Put the flour and butter into a food processor or blender and pulse until it resembles fine breadcrumbs. Add the chopped chilli, Parmesan cheese and seasoning, then pulse until well mixed. Pour the mixture into a large bowl and gradually add the cold water, stirring until the pastry comes together into a ball, you may need slightly more or less water than 2 tablespoons. Rest the pastry for 20-30 minutes before rolling out on a lightly floured surface to fit your tart tin. Preheat the oven to 200­°C /400ºF. Slice the cherry tomatoes in half. Into a medium bowl, put the grated Gruyère cheese, egg, double cream, herbs, salt and pepper - mix well with a fork until combined. Spread it over the tart base, covering the pastry completely. 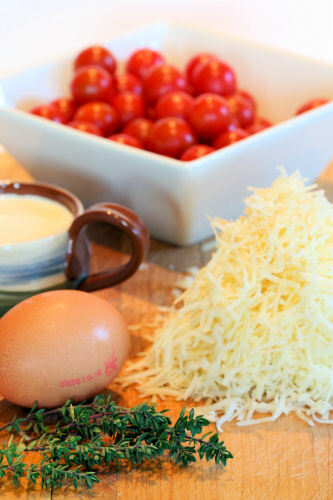 Place the cherry tomato halves onto the cheese mixture, pushing them down slightly. Bake for 40 -50 minutes until the pastry is cooked through and golden. Serve hot or cold. This is my contribution to the “Simple and in Season” monthly event held by Ren at Fabulicious Food. I am entering this recipe into a competition called a Taste for Tomatoes, being held at lovethegarden.com. Anyone can enter, even first time bloggers, so hop over and enter your own recipe! Drop dead gorgeous Nic...took my breath away! WANT!! The produce and the herbs...love it all! It looks absolutely beautiful and very tasty ! Loving the idea of chilli cheese pastry! 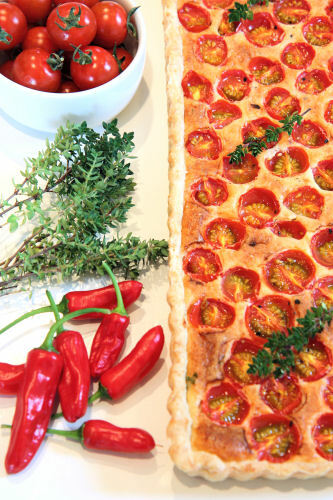 Love the idea of a tomato tart too! I'm in Nic. I love the little bit of heat in the pastry, which punches up the flavour factor. What a beautiful creation. I love tarts and yours looks especially delicious. 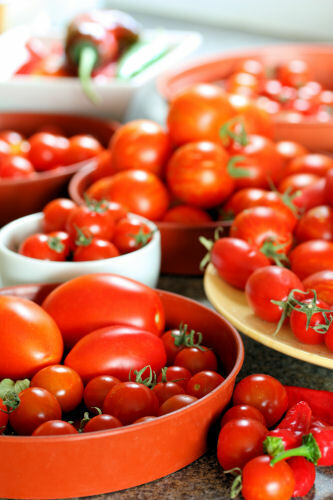 Love those summer tomatoes! What's not to like about this recipe? Nothing! The fresh produce made me like this recipe in an instant. Then again, it used Gruyère cheese.... Now I'm head over heels in love! What a gorgeous looking tart. Love the idea of adding a little chilli to the pastry for a little kick. Lovely! that's a stunning tart, nic, and i especially like the ingredients in the crust. very creative! Absolutely beautiful photos, Nic! Really gorgeous. And your tart looks fabulous too! Love the idea of chilli and cheese in the pastry. Mmmm! This extra blast of summer weather is perfect for this dish! Stunning. I do love flavoured pastry bases. Shame thought that we have not had much of a summer. 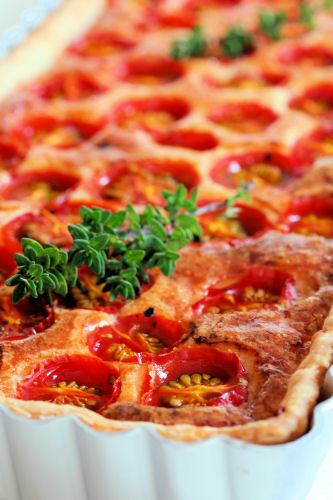 What a fabulously looking appetizing chili tomatoes tarte! I love your alternative pastry recipe a lot! I have made it & my husband & friends loved it so much! I served it with a mixed salad & a chili dressing! Oooh that looks good! I love the inclusion of Parmesan in the pastry crust, it must have added a really nice twist! A stunning recipe, thanks for entering it into Simple and in Season a round-up will follow today!